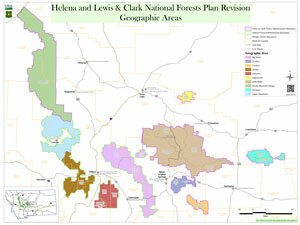 Beginning in the summer of 2014, the Helena and Lewis & Clark (HLC) National Forests in Montana started the process to revise and update their forest plans consistent with the 2012 planning rule. As part of this effort, the HLC engaged the Center to help design and facilitate a fair, effective, and efficient public engagement process. To inform the design and facilitation of this public engagement process, HLC and the Center agreed on the following process: (1) harvest lessons learned from the 13 national forests that are in the process of revising and updating their forest plans consistent with the 2012 planning rule; (2) conduct “listening sessions” with key stakeholders in the HLC region to seek their input and advice on the public participation process; (3) prepare a public engagement plan based on these two bodies of information, along with best practices for public participation based on over 50 years of experience by CNREP staff; and (4) work alongside HLC leadership and planning staff to implement the public engagement plan. Please contact Shawn Johnson for more information.